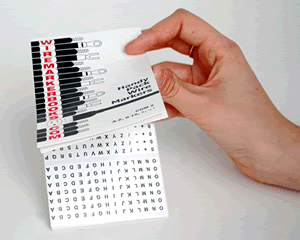 Wire Marker PocketPacks™ help you keep track of all your cable and wire markers. Packs contain letters, numbers or a variety of stickers, all with strong and durable adhesive. Simply click on a link for more details about a specific pack. Need bigger cards? Click here to see our Jumbo Marker Cards. • PocketPacks™ are the most convenient way to carry and dispense cable markers. Markers are printed on vinyl impregnated cloth, proven to be durable enough for maintenance, construction and easy cable identification. • Our wire markers are made to last when applied. They are mounted on Heavyweight Super Release dispenser cards, whose slick surface protects the markers' adhesive until used. • Adhesion to steel is 40 oz./in. with a temperature range of -40 degrees to 250 degrees Fahrenheit. • Still have doubts? Click here for a full Price Comparison Chart between WireMarkerBooks.com and our competitors. Wire Marker Cards come in sheets of letters, numbers and colors. Choose the sheets that work best for you! Both departments below have all of the Wire Marker Book options. The Quick Order page has a list of books with specs, so that you can quickly order or re-order multiple books. The All Wire Marker Books page has all of the books laid out so that you can see and compare the legends.